It was a particularly nice summer week and most of my friends were away on vacation. That was fine by me, for I had other engagements. In the summer of '97, I took a vacation in Master of Orion II. Staring at my flickering monitor, making imperious gestures at star-charts, obsessively meddling with starship designs and colony layouts, I was the unimpeachable, immortal ruler of the Darlock Empire. And, as the Darlocks eventually discovered to their dismay, putting a 16-year-old boy in a position of absolute power is perhaps not the best idea. With the power to decide the fate of millions, being in equal measure President of all planets in my dominion and Supreme Commander of the armed forces, it's not particularly strange that I, normally peaceful and friendly in real life, would turn into a monstrous, war-mongering dictator. Master of Orion II, even more than most 4X (explore, expand, exploit, and exterminate) games, lends itself particularly well to playing a galactic tyrant. Your advisors address you directly, personally. The game can span centuries of in-game time. There are no internal events which can see you ousted from power. 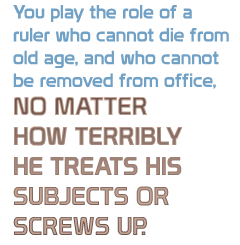 You play the role of a ruler who, probably through the use of advanced technology, cannot die from old age, and who cannot be removed from office, no matter how terribly he treats his subjects or screws up. Moreover, you get total control over the lives of the people in your empire. Not only can you decide which buildings are built in your colonies, but also which members of your population get to be workers, scientists or farmers. Got a world of technological marvel, filled with scientists studying the laws of the universe, but the nearest start-up colony needs food? Sorry, scientists, but you're farmers for the next decade. People are rioting because they're dying of starvation? Easily solved; just build a barracks, that's far faster than waiting for infrastructure to fully develop. See, it wasn't really my fault. The game made me a dictator, honest! I exaggerate somewhat, but the strong emphasis on the player being an actual character in charge of his people, while simultaneously creating such a distance between you and the same people (they are just another resource), does tend to turn you into a rather callous ruler. Of course, these musings occurred far after the events of this particular game. While playing, I was simply directing the fate of my worlds, building a war-machine, toggling the occupations of my people for maximum effect and researching cool stuff, primarily involving bigger ships with bigger guns. Eventually, the supply of free planets to settle runs out and you naturally turn to your neighbor's systems. And, when persuading them to give you some more worlds, it helps to have bigger guns than they do.